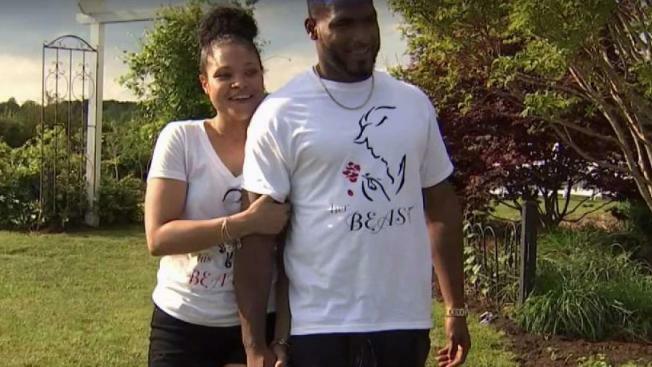 A couple who had to postpone their wedding after a deadly attack in Charlottesville, Virginia, last summer is finally tying the knot. Marcus Martin and Marissa Blair were protesting a white nationalist rally with their friend Heather Heyer on Aug. 12, 2017 when a driver suddenly plowed into the crowd. Heyer died in the crash. She was 32. Seconds before the car barreled through, Martin shoved Blair out of its path to save her. But the driver slammed into Martin, leaving him badly injured. An image of Martin's body in mid-air went viral. "I couldn't get out of bed, but Marissa was there every step, every...everything," Martin said. Martin couldn't continue his landscaping job while he recovered from his injuries and the couple had to put their wedding plans on pause. Then a community of vendors heard their story and decided to donate their services to Martin and Blair. "It's the right thing to do. It's for our community. That horrific day in Charlottesville, most of us couldn't believe that we were watching where we're from," said Christina Moore with Bella Giornata Events and Design. The venue at Walden Hall in Reva, Virginia, the caterer, the photographer all stepped up to help Martin and Blair have their wedding this weekend. "This day, we’ve been waiting for this day and we know it’s going to be more than we expected,“ Blair said. "We're definitely celebrating that love wins, that hate does not have the last word," Moore said. While the happy couple is overwhelmed with love, they cannot escape the memory of deep loss. To remember Heyer, they are having her mother, Susan Heyer, walk down the aisle and release butterflies. Through tragedy, the couple says they have learned an important lesson. "Expect nothing appreciate everything," Blair said.